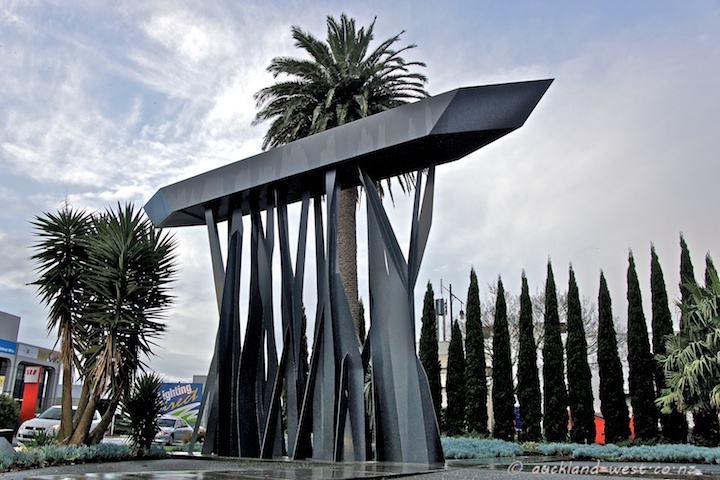 This sculpture is located at the intersection of Great North Road and Memorial Drive in New Lynn. It commemorates the ancient route of portage of canoes between the Manukau Harbour in the South and the Waitemata in the North. Reminiscent of how modern-day athletes carry their rowing boats high above their heads — although I would think that the heavy carved canoes were more likely dragged along the ground. No matter. The vertical mode of the sculpture is nicely emphasised by the row of cypress trees separating the small sculpture garden from a loading bay of Lynnmall. Unfortunately, this spot is rather neglected and poky, too peripheral to allow a sculpture of this size to make an impact. On closer inspection it turns out that this is in fact a sun dial, with time markers set in the grass and concrete, one set for equinox and one for solstice (the point of the ‘boat’ marking the time). Here’s hoping that the ongoing urban renewal of New Lynn will also reach this spot.